I am a headlamp addict. I use them all the time, reading, around the house, hiking, hunting, I practically always have one strapped to my head. People make fun of me. I should just change my name to "headlamp". I gave my Princeton Tec Apex away as a present with the intentions of getting myself another one, one of the new 100 lumen ones. I had read many reviews of the Mammut Lucido TX1 and only a couple negative ones and the hype really looked good. So I threw the dice on the Mammut instead of another Apex. I should have been suspicious when I could not find how bright it was in lumens, only a beam distance, whatever that means. But almost everyone seemed to like it so I ordered one. I waited with bated breath for my headlamp that was brighter than any headlamp ever conceived of, according to the hype. Even if the hype was wrong it surely would at least be just as good as my Apex. That square beam that everyone yaps about that penetrates for miles is as narrow as your hand. Great for illuminating a pinecone in the next county, useless for tracking game. OMG!!! And the floods! Or should I say "what floods?" The bright one is just bright enough to read with and I read with a rather dim setting. It also has a dual setting which you would think would be so awesome, and the Apex doesn't have a dual setting so this was going to rock, or so I thought. Well the floods are so dim the dual setting isn't much more than the beam setting. No wonder the batteries last so long. It does have a few neat features like blinkie lights built into the battery pack. Wish my Apex had that. Also the head of the lamp rotates backwards to protect it. And it doesn't glare on my glasses, a real pet peeve of mine. It seems to be very cheaply made as well, not what I would expect on a headlamp in that price range. The battery cover is merely a thin rubber cover. The lamp housing seems very light and thin with no padding where it touches your head. I at first thought this was going to be very uncomfortable, but actually it was pretty comfy. I haven't worn it long enough to really give it a tryout though. It's just not bright enough to perform any tasks with. Except for that spotlight beam, which is not broad enough to see much except for a pinpoint in front of you. I compared it with my Apex and the beam does indeed seem to be brighter. Not by much though. I compared it to my Petzl Tikka Plus and the Tikka is almost brighter on the lowest setting as the Mammut is on the brightest flood setting. The Mammut does have an amazingly even beam though. Great for reading and I do read in bed with headlamps a lot. I don't need a headlamp with a large battery pack to read with though. Moving on, the buttons are very hard to press. I wouldn't mind if the thing was actually bright but as it is it's just another negative. The button sequence is different than my Apex, a little confusing but I could get used to it. The battery pack comes off so you can put it in your shirt or something. What I would put in my shirt is a headlamp that can actually illuminate something. I don't understand all the love for the Mammut!??!? I wonder if those headlamp users have ever tried anything else? Oh, I finally found the info on lumens in fine print in the little sheet that came with it. 30 FRIGGIN' LUMENS ON HIGH SPOTLIGHT BEAM!!! oneone1111!!!eleventy!!! I think the floods are too dim to be measured my lumens. What on earth was Backpacker magazine thinking?!? I wish I could return it but I don't think I can as nothing is really wrong with it and I have used it some trying to find a use for it. It gets dark early here so I wear a headlamp and piddle in the yard. I am planting a garden this year and put my onions in. I have no Apex anymore (poor me) but I still have a Corona and Quad (and others) and both of those worked just fine in my garden. Last night I wore a headlamp so I wouldn't step in doggie poo when I took out the trash. I was trying out the Mammut. I didn't step in poopie but it was just luck because I had to strain to see turds. Any of my other headlamps and I actually forget it's night. When I first got it I wore it around the neighborhood and pretended I was tracking a deer. It didn't really work too well. The bright beam is just so narrow it doesn't work at all up close. Neither do the floods unfortunately. It was OK for cooking on the grill but luckily I have patio lights. I guess if I had never tried a headlamp I would have liked it more but I have an extensive headlamp collection. It just doesn't perform like a headlamp in that price range should perform. If it were 20 bucks I wouldn't call it a deal but I would not feel cheated either. In summary, the bright beam is too narrow to do much, and the floods to dim. The new Princeton Tec Apex had a 130 LUMEN SPOTLIGHT, and is cheaper to boot. The claims just don't make sense. I don't see what the appeal is to this light. Maybe it's battery longevity but I have never exasted my other headlamps' batteries on a trip. The blinkie thing is cool but I'm just reaching now because I don't normally give bad reviews. 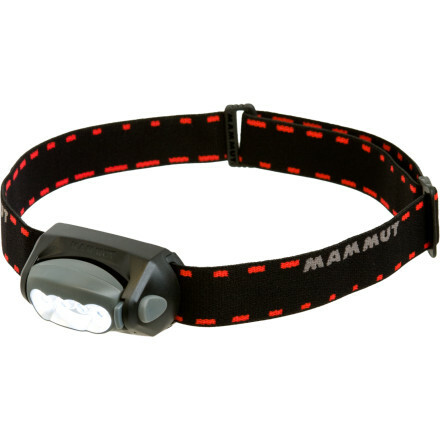 Minimal extrinsic-battery headlamp (meaning a giant step stronger than lamps with emitter/lens and battery all in one housing, but a giant step weaker than regulated-supply lamps with heat sinks and more or bigger cells), the TX1 is ideal for ordinary, non-critical activities that don't involve high risk or high speed. Spot is concentrated, floods are broad, both are fixed-focus. Margo Costan has a screw loose. Anyone with two functioning brain cells understands this perfectly capable headlamp isn't in the same league as a Princeton Tec Apex. I own two Apexes and one TX1 (plus five other headlamps and a sternum pack lamp and a dozen hand torches); all get used as appropriate. Out in the wild or underground where gear simply has to work, Apex is the only choice. But I just returned from new moon night skiing with the Mammut. The spot was just right for skiing and the low flood just right for hiking home afterward. With the lens turned backward (covering the switch pads so they can't be pressed accidentally), the TX1, in a small fabric pouch, fits nicely in my pocket. Apex would pour out vastly more light, naturally, but is much heavier, bulkier, and simply unnecessary for normal activities, not to mention considerably more expensive. I pack an Apex when I'm wearing a pack and there's even a remote chance of being out after dark, but wearing a pack just to pack a headlamp is nuts. Absurd hyperbole and obtuse, inaccurate indictment speak to some failing, but not of the TX1. 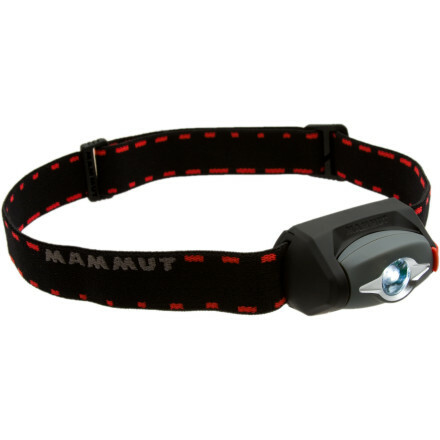 It isn't a revolutionary or exemplary headlamp, but it's a clever, competent, accomplished headlamp. 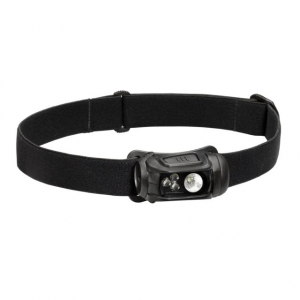 Used within its limitations (all headlamps have limitations) it's a great little sidekick. Mine has seen a lot of use in a wide range of conditions over many years and no part of it has failed (unlike Apex, which is a fantastic lamp but its less-flexible cables stress their strain-relief connections, even though mine live in rigid containers when not on my head). TX1 deserves 4 stars, but I'm going to give it 5 to partially compensate for Margo Costan's dyspeptic 1. Welcome to Trailspace, Karl, and thanks for the review! I hope you'll consider reviewing your Apex headlamp as well. The person who gave this a dismal review must have been using near-dead batteries. This thing is very, very bright, even with the "no-name" batteries that came with it. The lowest setting on the broad-coverage light is excellent for reading in the tent at night. I haven't even had to use the higher setting. The AA batteries are not that darned much heavier than AAA's, and I love the longer battery life. The spotlight is really awesome for showing off to friends! Don't know when or where I would use it, but I don't think the narrowness of the beam would be a problem. Point it where you want to go and jiggle it around for more coverage if necessary. I bought this at REI, where it was discounted and then discounted again! A good light and a good purchase!!!! Almost perfection. 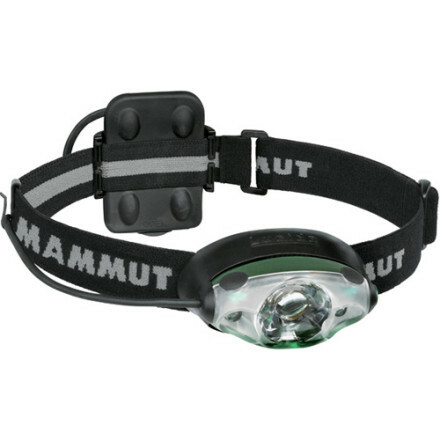 After years of looking off and on for a headlamp I thought I'd truly be pleased with, I finally took the plunge on the Mammut Lucido TX1. I'd first heard about it when Backpacker listed it among their Editor's Choices for 2008, and it seemed to have the features I was looking for: relatively compact, long-lasting battery life, useful up-close and campsite-distance modes, and the ability to really pierce the darkness when necessary. 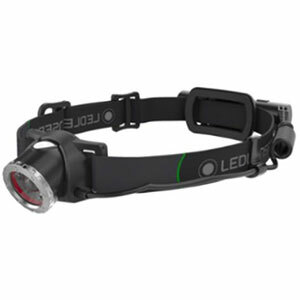 In addition, the Lucido offers up the ability to have flashing red LEDs blinking on the back of one's head--a plus when leading a night hike or if using it when biking--meaning that its use could be expanded further. Upon receiving the light and putting it through some test runs, I found that there are some things the lamp does wonderfully, and others not quite so well. First, the drawbacks: Like most all LED lamps, the light cast has a blue-gray tinge. Not seriously off-putting, but enough to be noticeable. Second, the light modes are controlled with two push-buttons adjacent to the lamp itself. It takes a bit of use to remember which activates the up-close light and which the very powerful distance beam, and the buttons are not as easily felt and activated with gloves on as I would like. Third is a quibble about the flashing red LEDs. When these are activated, the intermittent draw on the batteries causes the headlamp light itself to weaken and brighten in time with the flashing. Illumination isn't terrifically compromised, but it is noticeable, particularly at the periphery of light projection. Now for the good stuff. It's bright. Very bright. When using the high-beam, it is indeed possible to usefully illuminate something a hundred yards away. The close-up lighting comes from two LEDs focused so as to provide even illumination in a single circle of light, easily adjusted to the angle desired up/down. And it does last. More than 20 hours of on-time thus far, in various modes, and no noticeable loss of power yet. Being one who is alone in the woods more than most, dependability is a must, and I trust this light. Also, being a leader of Scout trips and similar outings, it's important to me to have a lamp that provides me with good but not overwhelming work lighting, too. And yes, the red flashing LEDs do come in handy when leading a group at night. Not perfect, but I'm happy with the purchase. 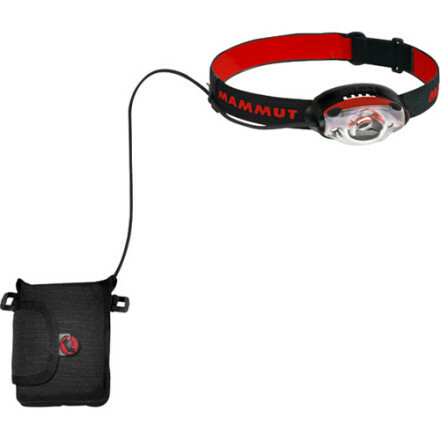 The Mammut Lucido TX1 is not available from the stores we monitor. It was last seen November 5, 2013	at CampSaver.com.